Tarot card 14. Tree Path 15. Joining Sephiroth 6 (Tiphereth) and 9 (Yesod). ‘The Owl’, ‘Fishing Bridge’, ‘Apprehensions’, ‘The Hands’. Tomb – Womb – Moon: the power of that round vowel at the heart of these three pervades the Path of Temperance. It holds the infinite zero of the Void, which is also the Nothing from which the Divine Spark created All in our universe. So, after death, after the dissolution of the body to bone-seed and watery chaos, new life begins again in the tomb-womb of Earth. Harmony, balance and unity must first be restored. On this Path, where the Moon of Yesod is joined with the Sun of Tiphereth on the central Pillar of Balance, and both receive energies directly from the Divine Source through Kether at the Crown of the Tree, all contraries are reconciled. So, body and spirit, human and divine, male and female, intuition and will, and all such (seeming) dualities are united and become part of the whole. On this Path, too, the image of the bow is of great importance. It is the hunter’s bow of the Moon Goddess, Diana; the starry bow of the Archer, Sagittarius, whose astrological path this is; the rainbow of the goddess Iris; and the rainbow of colours which mark the completion of an alchemical transmutation. Arrow and bow, potential energy and motive force, spirit and will, are no longer separate but connected halves of a potential whole, like the sperm and the egg which must merge before being animated by the Divine Spark of life. So, the arrow becomes a symbol of “directed Will” and the occult significance of this on this Path of Samekh, according to Crowley, is that the arrow, figuratively wielded by Sagittarius, pierces the rainbow represented by the Hebrew letters for the last three Paths on the Cabbalistic Tree and foreshadows “the light of Truth”1. Foreshadowing and foresight are part of the circling life-energies of this Path. In Alchemy, in the Bible and in ancient myths of the Great Deluge, the end of death and chaos is marked by the appearance of a rainbow which signifies both a new beginning and the imminence of the Divine in our material world. In the rainbow, Fire and Water combine with Air to form an arch which joins Heaven and Earth: thus, a circle is completed and the four elements – the alchemical Mothers – are held temporarily in a balance which contains all potential for new life. The same symbolism pervades the Traditional Tarot card for the Path of Temperance. 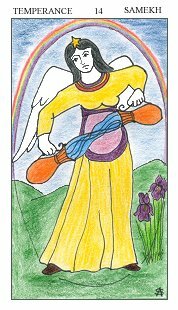 The Rainbow Goddess, Iris, Heavenly messenger of both Zeus and Juno, is shown standing on Earth. In each hand she holds a golden cup (two symbols of Fire) between which Water flows through Air, in a continuous, magically suspended stream. Thus, she brings all four elements together and, at the same time, her body, her arms, the cups and the water, make a continuous circle which, like the Uroborus of Nature, contains All and Nothing. This womb-shaped circle is seen again in the shape of the Hebrew letter for this Path, Samekh, which means ‘prop’ or ‘support’; and one Cabbalistic meditation for this Path is ‘The Womb protecting Life’. Also, the numbers associated with both the Tarot card of Temperance (fourteen) and the Cabbalistic Path of Samekh (fifteen) figuratively demonstrate this Divine support: 14 shows the Divine (represented by 1) alongside the 4 of the elements and the material world; 15, shows the Divine beside the 5 of the pentagram which, for Cabbalists, commonly symbolizes Mankind (often the Cabbalists’ pentagram shows Man spread eagle in its five-pointed star). So, for the Cabbalistic journeyer on this Path of Temperance, Divine support is close at hand and there is the potential for creating new wholeness at the start of a new, interior journey. However, a second meditation for this Path, ‘Self Control and Self Sacrifice’, suggests the care which he or she must take to achieve a balance between the human and the Divine. Temperance is essential if the Divine energies which are shown to the traveller on this Path are to be well used. The Birthday Letters poem on the Path of Temperance in the Atziluthic World is ‘The Owl’ (BL 33). The time the poem describes is Spring 1956 and, as noted in my discussion of ‘Fate Playing’ in the previous chapter, Ted and Sylvia were so newly united by love at this time that each, in ‘The Owl’, begins to see the world through the eyes of the other. Suitably, on this Path, they are bonded together like the alchemical hermaphrodite (which is associated with this Path) and each becomes like a child again through this new, shared experience. Sylvia, joyous as any new mother, is enthralled by the natural world which Ted helps her to discover: and he becomes a young, “dumb, ecstatic” boy again as he sees his world of Nature anew through Sylvia’s eyes. The repetition of “your eyes” and “your children’s eyes” at the ends of the first and second lines of the poem emphasizes the child-like quality of their vision and their response to this newness. As always in this Atziluthic World they are still childish-Foolish adventurers at the start of their Cabbalistic journey. And temperance was clearly a virtue which had still to be learned, as Sylvia’s rapturous letter to her mother about Ted and love and Grantchester, and “baby owls, cows and even a water-rat”, clearly shows (SPLH 3 May 1956). In the second line of the poem, Ted notes, too, that this experience will come full circle for him when his world is renewed again through their children’s eyes, but his choice of pronoun here (“your” rather than “our”) suggests an ominous foreshadowing of Sylvia’s death, which would permanently separate them. Throughout the poem, however, Ted and Sylvia are very much alive, although the whole atmosphere is one of Mercurial dream-like “hypnagogic” ecstasy. The world is suddenly “foreign”, a mystery full of “aliens” and “reflections” a place in which common things seem unearthly, and Sylvia’s “incredulous” frenzy of joy makes Ted “giddy”. This (as in other Birthday Letters poems, such as ‘Epiphany’BL 113) is the moony, magical, trance-like atmosphere in which the Mother Goddess demonstrates her power to her human followers. And it is her creature, the owl, which gives this poem its title and which appears at the poem’s climax. Long before ‘Iris’ became the name of the Rainbow Goddess, she was known as ‘Inanna’, then as ‘Ishtar’. In Bronze Age, Sumerian myth she wielded first the rainbow necklace, then the bows and arrows of war; and amongst her many titles she was ‘Great Mother’, ‘Queen of the Great Above and the Great Below’ and ‘Divine Lady Owl’2. So, here, on Iris’s Path, the Goddess’s owl appears. But its message is ambiguous. Throughout this poem it is clear that nature is Ted’s world. He was the “midwife” of all the natural wonders which enthralled them both, and it was he who used an old hunter’s trick (sucking his knuckle to imitate the cry of a distressed rabbit) to call the owl to them out of the copse. Sylvia’s poem, ‘Faun’ (SPCP 35) describes this incident and makes Ted, in the final lines, a horned god like Cernunnos, galloping “woodward” in the starlit night. But the owl in Ted’s poem swoops up and splays its pinions into his face, as if in warning. It does not take him for a god, or even for a human, but “for a post” – a senseless block of wood; an object which might be used for its own purposes. The anti-climax of this final phrase is a curiously deflating comment on what Ted has just called “My masterpiece”. At the time, the appearance of the owl, apparently at Ted’s bidding, was a wonder which clearly impressed both Ted and Sylvia. But the owl is also associated with Hecate, the Moon Goddess as Hag, and because of this it has the folklore reputation of being a harbinger of death. In this poem, and on this Path where the future is held in potential in the womb-like circle, the owl’s warning must be taken seriously. Ted already seems to have foreshadowed Sylvia’s death at the start of the poem: at its end, with the owl’s warning, he completes the circle. In ‘The Owl’, however, death is as shadowy as the echo of ‘corpse’ in the “copse” in which Ted’s owl was “enquiring”. No warning is spelt out. And it is worth noting that in all Ted’s owl poems3 the owl is an ambivalent creature which combines beauty and blessings with fearsomeness and death4. Ted and Sylvia, in ‘The Owl’, were still in the Atziluthic World and at the start of their shared journey. Nothing, yet, was certain. The owl’s appearance, then, as they made their way along the Path of Temperance for the first time, on the threshold of exploring their unconscious, inner worlds, was a sign from the Goddess that she would be with them from then on. But even in this, because of her power and because of her many aspects, there was a warning. ‘Fishing Bridge’(BL 87-88) which is the poem on this Path in the World of Briah, sees Ted and Sylvia again as “naive pioneers” on a new threshold. The word ‘threshold’ recurs twice in the first seven lines of the poem. And it recurs twice more as they, in their boat between two banks of the river, on their journey across Americas between two stages of their lives, exist for a brief period in a state where all choices about their future, many “glittering” offers, and “too many thresholds”, are open to them. At this moment of suspension in their lives, Ted describes their “precautions” about their situation as “petty”. And the ambiguity of “to keep our skulls clear of the whizzing leads” deliberately and carefully conflates actual and metaphorical meanings. So, realistic as Ted’s picture is of himself and Sylvia fishing in Yellowstone Park, in danger of being hit on the head by the lead fishing-weights of holiday anglers, they may also be seen trying to keep their heads empty of the many colourful (but weighty) choices and leads (or directions) being offered to them by others. At this time, too, Ted and Sylvia, were “holiday anglers” in more senses than one. Not only were they catching “weary” fish with “little finesse”, they were also fishing for the right path by which to achieve their goals and, in the process perhaps (since this is the fluid, creative World of Briah), catching a few “limited” poems such as those which Sylvia described in her journal as “exercises” [her punctuation] (SPJ 13 Oct. 1959). There in Yellowstone, a wilderness in the land which they had once thought of as their “Promised Land”, Nature showed them her abundance. The “massed” waters which in Ted’s sequence River are “the generator”, “the chrism of birth” and “the sun’s oiled snake” (‘Flesh of Light’ R 16) flow beneath their boat, in ‘Fishing Bridge’, like life-blood from “a cut throat”. Nature beckons them with her “infinite endowment”. And the “brilliantly lit” potential for happiness and abundance which surrounds this threshold at the start of this poem is as emblematic as the opening page of Blake’s Gates of Paradise5, on which he depicted the rising sun arched like a bridge between “The Gates” and “Paradise”. But Ted and Sylvia were still distracted by worldly things. Ted remembers a sun-lit moment when Sylvia, almost naked, full of delight, nearly “stepped into America”; and his use of ‘America’ here, clearly has symbolic meaning. So, his image is of Sylvia, almost soul naked, about to step in to Paradise: and the bikini she wears is the only remaining fragment of her present life and of the social conventions which she and Ted were trying to shrug off. But she, then both of them, “turned back”. From the start of the poem Ted has emphasized their inexperience – that they did not know what they were seeing. Everything lay before them, and Nature “leaned over” the threshold to show them the “bounty” to which they, like the trout, could be led. But not only were they half-blinded by too many “glittering” offers, they deliberately held their eyes open to one compelling offer made by a voice which promised to lead them to their “true selves”. Instead, it led them into darkness and, finally, to Sylvia’s death. In retrospect, in ‘Fishing Bridge’, Ted questions everything about that voice. He questions its nature, its directions, its promises and even the premises on which these promises were based. “What voice” was it? Why should they seek their “true selves” or their souls in the labyrinth? Why should they “search and search”? What does open at the heart of the maze? In the poem, he associates the voice only with darkness, confusion, dreams and hypnosis: it is “masterful”, the voice of a “monomaniac” who has “never heard of the shining lake” which Nature had shown them. And the doorway to which it directed them led only to “crying and loss”. It may seem to the reader of Birthday Letters that this voice could belong only to Sylvia’s father, Otto, who is associated throughout the book with labyrinths, darkness and death. Why, then, does Ted not say so? Judging by what Ted wrote elsewhere, it was not that simple. In his essay, ‘Sylvia Plath and her Journals’(WP 177 -190), Ted wrote that he and Sylvia had occasionally consulted the Ouija board in the “late fifties” (the time of this poem) and that spirits would arrive with messages for Sylvia “from Prince Otto”, a “great power in the underworld”. Prince Otto, she was told, took orders from the Colossus. This Colossus, Ted wrote, became “more and more central” to Sylvia’s poetry and to the process of “Self-individuation” which she underwent between 1953 and 1959; and he describes this process as weirdly autonomous, a sort of biological necessity “beyond her manipulative interference” (WP 180-1). All this became the subject matter for Sylvia’s poetry, although she felt its control over her as tyrannical. Even after the “rebirth” which Ted noted in ‘The Stones’(SPCP 136 - 7), and which Sylvia wrote at Yaddo just after their journey across America, Sylvia’s journal shows her still driven to search for her true Self and still obsessed with her own creative inadequacies. According to Ted’s interpretation, all of Sylvia’s writing until just before her death was about her past and her struggle for Self. Only in late 1961 did Sylvia’s newborn Poetic Self “feel the draught from the outer world” but even then it was fleeting, and Sylvia plunged back into her inner world, which found its strongest expression in her Ariel poems. Ted, sleepwalking alongside Sylvia (as he says in ‘9 Willow Street’(BL 74)), was also “hypnotized” by the inner voice which drove her and together they groped, searched and struggled according to its uncertain directions. All their attention was focussed on the past and on their present search: it was “not for the future”, and for Sylvia, there would not be any future, because this “dark and difficult” doorway through which the voice took them led only to her death. No wonder, in ‘Fishing Bridge’, Ted questions everything about that voice. Was it the voice of a spirit? If so, Sylvia internalized it to the extent that it drove her without any recourse to the Ouija board. Or was it Sylvia’s own inner Poetic Self struggling for release and finally achieving it through Ariel? Was searching and searching for their “true selves”, then, the right path to “perfected vision”? Perhaps not. The maxim ‘Know thyself!”, which is part of all spiritual quests, does not mean you should focus solely on yourself and search only for your own perfection. On the contrary, it means accepting yourself as you are, understanding your abilities and your limitations, stripping away all selfish, material desires and humbly submitting yourself to the guidance of the Divine. Yet, it seems in ‘Fishing Bridge’ that both Sylvia and Ted had little choice but to follow the voice. They were inexperienced, did not recognize the support (the prop, Samekh) of the Divine already beside them (as Nature showed it to them); and the voice tempted them on by promising them all they thought they should be seeking. The lessons which they still had to learn, it seems, were the strength to resist temptation (and Sylvia, as her journal entries show, was still very much in thrall to material ambitions), the ability to recognize an intemperate path, and the need to be constantly awake and alert. The voice, in a sense, was that of their own inner demons, and it no more knew the correct path than they did, hence the “dead ends” and “reversals” they encountered. In the final lines of the poem, Ted writes not of “the thing” I found, but of “the thing we had found”. Grammatically, that ‘we’ links Ted to the voice – he is gripped by it and forced to confront this “thing” – but throughout the poem “we” refers to Ted and Sylvia. So, the discovery seems to encompass all three, and the thing “we had found”, was that this search ended with Sylvia’s death. So even in these lines there is a question: was this the maze’s centre? All the questions suggest that Ted felt that the path they had chosen was not the right path. At the centre of any maze one is forced to stop, at least briefly in order to turn about. But in all the questing myths the hero eventually returns. There may be a monster, and death often has to be faced, but with Divine help the monster is killed, the maze is re-negotiated, and the hero is reborn into the light. In ‘Fishing Bridge’ there is no monster, only Sylvia, dead, dead, dead (the word is repeated three times in these last lines). But the questions remain. Was this the heart of the maze? Was this what they were meant to discover? We are given no answer. Sylvia’s eyes, those mirrors of the soul, are as brown-bright as they were when she and Ted were shown Nature’s glory at the start of the poem – as they were when he and she were “nearly happy” - but now they are “unmoving and dead”. So, the awful finality of this final line brings the poem, all the potential for joy with which the poem began, their search, “everything”, to a full stop. ‘Apprehensions’(BL 140), on the Path of Temperance in the World of Yetzirah, shares its title with a poem Sylvia wrote and dated 28 May 1962 (SPCP 195 - 6). Both poems reflect the multiple meanings of ‘Apprehend’, dealing with fear of approaching dangers; with things grasped by the mind, whether real or imaginary; and with arrest: both the need to stop these dangers in their tracks and prevent them causing harm, and the physical arrest of breath, thought and creativity which fear brings. Sylvia’s poem, interestingly, reflects the four Cabbalistic Worlds as the Worlds of the alchemical Mothers – Fire, Air, Water and Earth – as if overlapped on a single Tree6. The first stanza of Sylvia’s poem deals with the fiery heavens of sun and of the stars and angels, which she calls her “medium”, suggesting that she her spirit communicates with them. The second stanza is associated with the mind and the airy, creative world of ideas. The third with the world of the material body (what Sylvia describes is what we all are “made of”, and we are 70% water); and the fourth with the black, earthy, underworld of death. But in all four stanzas she confronts a wall which she cannot surmount; and she apprehends physical and emotional horrors, the closeness of death and, finally, the rapid approach of emptiness, “cold blanks”, the Void. In Cabbala, on this current Path, Sylvia was in a place where the two lowest Cabbalistic Worlds overlap and Yesod (Sephira 9), at one end of her Path, was at the bottom of the Yetziritic World in which she moved but was overlapping the heart of the lowest World of Assiah. 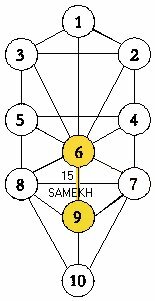 In addition to this, although Yesod is connected directly through Tiphereth to Kether at the Crown of the Tree, it also receives energies directly from Malkuth (Sephiroth 10) at the bottom of the Tree, on the edge of the Void. Yesod, therefore, is not only the Sephiroth which the Cabbalistic journeyer approaches with the accumulated understanding of their journey along the earlier Paths, and the place where Divine support is shown to them, it is also (especially towards the very end of their journey, as they probe deeper into the dark unconscious within and around them) a place where the demons of darkness are very close. 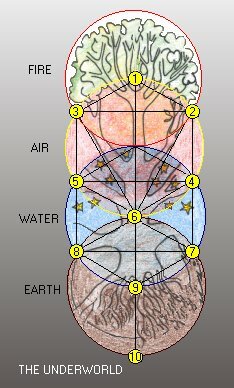 Yesod is the ‘Foundation’, “the most occult of the Sephiroth”7, and the most subtle and the most magical of them. Its Spiritual Experience is the ‘Vision of the Machinery of the Universe’, so it is here that nature shows her bounty. But Yesod is also a place of intuition, clairvoyance and illusion. Its Qlippoth are ‘Bad Foundations’ and ‘Dependence’; and the latter, in extreme cases, may even become a state of possession. So, the apprehensions which are the subject and title of both Sylvia’s and Ted’s poems, have specific Cabbalistic meaning. Ted’s poem, in particular, shows Sylvia’s awareness of and fear of being possessed by some malevolent force; and it suggests the nature of the energies she seemed to be channelling through her pen into her work. But Sylvia’s poem, too, shows not only her own dark ‘Vision of the Machinery of the Universe’, but that she was aware of a threatening “well” of darkness always behind her, and of “unidentifiable birds” whose cries portended final nothingness. Her fear drove her to write, and this fear possessed her: so, as in the first line of Ted’s poem, her writing “was also” her fear. It threatened her with the loss of everything she held dear, and it coloured her world (Ted says) to the extent that she could feel it, taste it, hear it in everything she did; and see it in every object which had special meaning for her. Her pen in particular, through which her subconscious, poetical energies were directed onto her pages (as if through a magician’s wand), became “black, fat” and sinister. And with such apprehensions – such a concept of the possible function of her pen and of the “goblins” which might “burst out” of it – she would “stop”, arrested by these thoughts but also deliberately arresting them “mid-word”. ‘Self Control and Self Sacrifice Govern the Wheel’: and on this Path Temperance is all important. Sylvia, clearly, was able to exert control, to stop writing, and to choose and shape the words. Her fear was no longer simply a subconscious drive but something of which she was consciously aware and which Ted links in the poem to all her senses, and to all the physical objects which were important to her. Sylvia, now, was courageously willing to confront that fear and to hazard all she held dear. On this particular Path, it is important to note that Sylvia’s courage and her words were a product of both energy and will. The spirit which inspired her (or which, perhaps, she allowed to possess her) stood in relation to her as the number one stands to the number five on this Path. It was there for support (however good or bad the result) and although she could not ignore its promptings she could choose to direct it in whatever way she wished. Temperance should have governed all her choices and actions, but it did not: she chose not only to let the angry words flow intemperately but to publish them as well. With such a bad Foundation on this Path there could be no end but the one Sylvia intuitively foresaw and feared. So, everything was taken from her, even the favourite pen through which those energies had flowed under her hand. And the pen’s removal by “somebody” unknown or un-named, in the final line of Ted’s poem, not only emphasizes the totality of Sylvia’s loss, it also suggests that there was some residual power in the pen which continued to inflict hurt even after her death. So, Ted ritually breaks any possible connection between such a power and Sylvia by confining the pen and the person who took it to a single, isolated, line at the poem’s end. In the lower World of Assiah, the World of Shells, the poem on this Path is ‘The Hands’(BL 184 - 5). It begins with live, supportive and nurturing hands but ends with “empty gloves”. In this poem, possession or loss of control, which is the Qlippoth of Yesod, overwhelms Sylvia. And perhaps this was caused by the Illusion of Yesod, an illusion of ‘Identity’, because her identity became that of the voice which spoke through her poetry: the voice of Ariel, which was a powerful and courageous voice but also an intemperate voice of anger and revenge. That was the voice in her poems, the angry voice in her “last-stand letters”, the voice she directed at Ted. It was the inner voice to which she listened, and, like fingerprints, it was unique. But did this voice belong to the being whose hands “dandled” her in her infancy and helped her in her suicide attempt in 1953? Throughout the poem, the hands belong to some “other” whose identity is un-named but whose power is “immense”. And Sylvia was its chosen vehicle, although, looking back, Ted “sometimes” thought he, too, was used by it. Sylvia herself wrote of the immensity of her father. He was the one who, thinly disguised in one of her stories, “tossed her up in the air” and caught her; “a giant of a man” whose judgement was never mistaken (‘Among the Bumblebees’ JPBD 259). He was Prince Otto and Kollossus, whose spirit directions she followed when she wrote ‘Lorelei’(SPCP 94 and note p. 287) 8. It was he who became her “bullman” (‘The Beast’ SPCP 134) and the Daddy she tried to get “back, back, back to” (SPCP 224). Perhaps indirectly, through the psychological wound which his death caused, Sylvia’s father’s hands were associated with her suicide attempt, but in her journal entries immediately before that attempt she argued with herself as if with some being within her who controlled her emotions and feelings. Rationally, she told herself to stop being frightened, to fight her anger at her mother and her desire to “escape”, “to retreat in to not caring [sic. ]” (SPJ 14 July 1953). But rationality cannot always control our feelings and desires. What Sylvia desired was quiet, and in Ted’s poem the hands “quietly / “Positioned” her and “fed” her in her desperate attempt to achieve this. In fact, of course, the hands which did all this were Sylvia’s. So, as part of her recovery she “got help” to try and understand what she had done and why. The stories and journal entries in which Sylvia tells something of that first suicide attempt and of the help she later received from doctors and psychiatrists, suggests that she learned that what drove her was suppressed anger. They suggest that she learned that her anger was caused by her father’s death, her mother’s control, her resentment of society’s expectations of her; and that to be healed, she must release that buried anger. What she learned (and perhaps “could not believe”, although she tried to), was based on of the prevailing practice of psychological analysis and treatment. And Sylvia did learn to release her anger in her writing, but it did not diminish her sense of some ‘Other’ within her whose control she feared and fought against, and whose presence does, indeed, lie in many of her poems like fingerprints in gloves. Sometimes that ‘Other’ is male, as in ‘Full Fathom Five’ (SPCP 92 - 93), ‘Electra on Azalea Path’(SPCP 116 - 7), and ‘Daddy’; sometimes female, as in ‘The Disquieting Muses’(SPCP 74 -6) and ‘Medusa’(SPCP 224 - 6). But in ‘Poem for a Birthday’(SPCP 131 - 136) Sylvia recognized it as the Goddess, “Mother of otherness”, “the one mouth” to whom, in a poetic and metaphorical recreation of her earlier suicide attempt, she fed herself in a process of poetic rebirth. This goddess is Iris / Inanna, whose great hands control the waters of life (as they do on the Tarot card for this Path) and whose powers are bound up with the mystery of life and death: the mystery of Self, of instinct and will, conscious and unconscious, self-control and self-sacrifice. Throughout Birthday Letters, Ted has suggested that Sylvia embodied the Goddess. In ‘Sylvia Plath and her Journals’, he also suggested that the ‘Other’ was her buried Poetic Self, fuelled by the Goddesses energies, which struggled for release. He charted the internal struggle for healing which Sylvia went through as she released and confronted the “The Other – the deathly woman at the heart of everything”. And he described Sylvia’s poetry as “the biology of Ariel, the ontology of Ariel” and Sylvia’s “whole oeuvre” as the expression of “a continuous hermetically sealed process of change” which “dominated her life” (WP 178 - 9). It was the Mother Goddesses energies which both Ted and Sylvia glimpsed in ‘The Badlands’: the all-enveloping snake energies which come, as Ted wrote elsewhere, from “the core of life like the black, ultimate resource of the organism” and which are, paradoxically, the source of all healing9. It was exactly this sort of healing which Ted described Sylvia as seeking through her poetry; and he described the driven, “singularity” of her work as a mystery, but one which expressed her “bee-line instinct… for nursing and repairing the damaged and threatened nucleus of the self”10. It was the Goddesses energies, then, which Ted believed drove Sylvia to write; and it was the Goddesses energies, which found their strongest expression in the voice of Ariel, which are still to be found like fingerprints in Sylvia’s poems, letters and stories. Ted wrote of Sylvia’s courage as she underwent the struggle to release and control these energies within her, and of the eventual birth of “a new self-conquering self” in the Ariel poems. But he wrote, too, of her “ultimate defeat”. And “Finally”, looking back as he wrote ‘The Hands’, it seemed to him that evidence of the controlling presence of the Goddess was there inside everything both he and Sylvia did in the last months of her life. Sylvia, exhausted, had relinquished control; he, numbed by everything which was happening, was unwary. So, the Goddess possessed them both. Ted’s poem ends with Sylvia’s death. She and all the energies she embodied have vanished like the living hands which shaped her work. What remains, are “gloves”, shells, poems and stories within which only traces of her unique energies remain, like fingerprints. And Ted’s use of the phrase “these, here” conveys the belief that it is the nature of all creative work, including his own poem on this printed page before the reader, to share that fate. The best that can be hoped for, is that the Goddess inspires and supports the poet in a dynamic, fluid dance of shared powers until the poem is written. After that, it becomes something fixed, which contains only traces of the energies which created it. In different words, but ones which Ted used in his interview with Ekbert Faas in 1970, once the poem is written the ritual is over and “the work goes dead”. “In the end”, Ted said then, “one’s poems are ragged dirty undated letters from remote battles and weddings and one thing and another”11. 1. Crowley discussed the arrow in detail in Chapter XIV of The Book of Thoth, pp. 101 - 139. It is also part of his vision (pp. 139 - 142) but its significance there is occult and personal. 2. 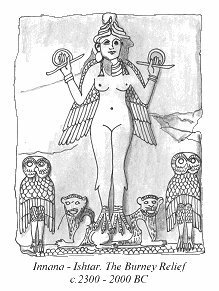 ‘Ninna’ is the Sumerian word for owl, and Inanna was also know as ‘Nin-ninna’. Baring and Cashford, The Myth of the Goddess, Viking, 1991, p. 216. 3. For example, ‘The Snowy Owl’ in Under the North Star, p. 16; ‘Owl’ in What is the Truth?, pp. 96-7; ‘Owl’ in The Cat and the Cuckoo, p. 24. 4. This is especially so in ‘The owl-flower’ in the Alchemical Cave Drama of Cave Birds, which occupies a place in that sequence which is almost exactly parallel to that of the Path of Temperance on the Cabbalistic Tree. I discuss the alchemical meaning of this poem in detail in Ted Hughes: The Poetic Quest, pp. 129 - 130. 5. The illustration I refer to is in William Blake’s later version of The Gates of Paradise. This book was an emblem book depicting a spiritual journey as a journey through life and in the later version, which Blake intended “For the Sexes” rather than “For Children”, he included two pages on which he listed “The Keys of the Gates”. 6. It is quite usual for the four Worlds to be linked with the four Mother elements in this way. And, since the four Cabbalistic Worlds always overlap, it is quite common for them to be shown on a single, compound Sephirothic Tree, with the Atziluthic World occupying the topmost part of the Tree and the World of Assiah at the bottom. Only in the Atziluthic World and in the World of Assiah do parts of the Sephirothic Tree not overlap but extend, respectively, into the Heavens or into the Underworld. 7. Colin Low’s discussion of Yesod is very detailed and he calls it this. Notes on Kabbalah p. 36. 8. SPJ 4 July 1958 and 9 July 1958. 9. ‘The Hanged Man and the Dragonfly’, WP 92. 10. ‘Sylvia Plath and her Journals’, WP 179-9. 11. Faas, UU 204 - 5.